Feel as good as the wild ponies of Assateague Island. We’re getting ready for a couple of quiet winter months here at our Chincoteague Island Bed and Breakfast. Guests are here through December 4, but the inn will be closed for the winter season between December 5, 2011 and February 9, 2012. That said, we’re already looking ahead to next spring. To celebrate our spring re-opening, we’re offering a Spring 2012 Special at our Chincoteague Island Bed and Breakfast. Guests may stay three nights for the price of two, or four nights for the price of three, or five nights for the cost of four. Spring is one of our favorite times on Chincoteague and Assateague Islands. Birds – always abundant – flock to the islands and cheerfully wake us with their calls. Brisk days are tempered by mild days, and the air smells salty and green and good. It feels great to be outdoors, and great to curl up by the fire with a cup of tea, a glass of wine, or a good book. The islands are still quiet in the spring. Shops are open, but summer beach-goers haven’t yet arrived. Beaches stretch out before us, inviting us to explore areas we’ve neglected for a while. The Piping Plover Nesting Area, on the hook of Assateague Island, is open to the public until March 15; it’s a long walk around Toms Cove to the tip of the hook, so we always bring plenty of snacks. We also love to explore the islands by bike in February and March, for there is little traffic. Bikes are available for use by guests of our Chincoteague Island Bed and Breakfast, and we’ll happily recommend good bike routes. 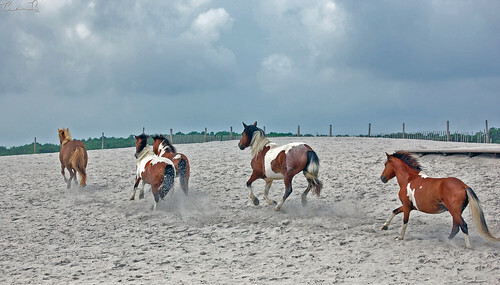 Like us, the famous wild ponies of Assateague Island live here year-round. Wildlife viewing boat tours are the best way to see the ponies up close, and our concierge service will make the necessary arrangements. Folks who would rather keep both feet on land may well see the ponies while exploring the Chincoteague National Wildlife Refuge by bike or on foot. After spending a few hours in the fresh air, a cup of warm, aromatic tea feels just right. Miss Molly’s, our sister inn, offers a full English tea every afternoon. To sink the teeth into a rich scone smothered in jam and cream is to taste heaven. Afternoon tea is particularly good on blustery days, but be careful – they’re deliciously addictive. It’s not too early to look ahead to spring. In fact, winter can be much more enjoyable when you know you have a good vacation planned at our Chincoteague Island Bed and Breakfast.